Phencyclidine (a complex clip of the chemical name 1-(1-phenylcyclohexyl)piperidine), commonly initialized as PCP and known colloquially as Angel Dust and many other names, is a recreational dissociative drug. It was brought to market in the 1950s as an anesthetic pharmaceutical drug but was taken off the market in 1965 due to its dissociative hallucinogenic side effects. In chemical structure, PCP is an arylcyclohexylamine derivative, and, in pharmacology, it is a member of the family of dissociative anesthetics. PCP works primarily as an NMDA receptor antagonist, which blocks the activity of the NMDA receptor and, like most anti-glutamatergic hallucinogens, is significantly more dangerous than other categories of hallucinogens. As a recreational drug, PCP may be ingested, smoked, inhaled or injected. PCP is well known for its primary action on ionotropic glutamate receptors, such as the NMDA receptor in rats and in rat brain homogenate. As such, PCP is an NMDA receptor antagonist. Other NMDA receptor antagonists include ketamine, tiletamine, dextromethorphan, nitrous oxide, MK-801, and dexoxadrol. NMDA receptors mediate excitation, however, studies have shown that PCP unexpectedly produces substantial cortical activation in humans and rodents. Research also indicates that PCP inhibits nicotinic acetylcholine (nACh) receptors. Analogues of PCP exhibit varying potency at nACh receptors and NMDA receptors. Findings demonstrate that presynaptic nicotinic acetylcholine (nACh) and NMDA receptor interactions influence postsynaptic maturation of glutamatergic synapses and consequently impact synaptic development and plasticity in the brain. These effects can lead to inhibition of excitatory glutamate activity in certain brain regions such as the hippocampus and cerebellum thus potentially leading to memory loss as one of the effects of prolonged use. Acute effects on the cerebellum manifest as changes in blood pressure, breathing rate, pulse rate, and loss of muscular coordination during intoxication. PCP, like ketamine, also acts as a D2 receptor partial agonist in rat brain homogenate and has affinity for human cloned D2 receptors. This activity may be associated with some of the other more psychotic features of PCP intoxication, which is evidenced by the successful use of D2 receptor antagonists (such as haloperidol) in the treatment of PCP psychosis. In addition to its well explored interactions with NMDA receptors, PCP have also been to shown to associate with certain dopamine reuptake carrier proteins and lead to increased levels of available dopamine. Additionally, studies on rats indicate that PCP indirectly interacts with endorphin and enkephalin receptors to produce analgesia. PCP is metabolized into PCHP, PPC and PCAA. Conversion of PCP into PC and piperidine by heat. More than 30 different analogues of PCP were reported as being used on the street during the 1970s and 1980s, mainly in the USA. The best known of these are rolicyclidine (PCPy or 1-(1-phenylcyclohexyl)pyrrolidine); eticyclidine (PCE or N-ethyl-1-phenylcyclohexylamine); and tenocyclidine (TCP or 1-(1-(2-thienyl)cyclohexyl)piperidine). These compounds were never widely used and did not seem to be as well accepted by users as PCP itself, however they were all added onto Schedule I of the Controlled Substance Act because of their putative similar effects. Some studies found that, like other NMDA receptor antagonists, phencyclidine can cause a kind of brain damage called Olney's lesions in rats. Studies conducted on rats showed that high doses of the NMDA receptor antagonist dizocilpine caused reversible vacuoles to form in certain regions of the rats' brains. All studies of Olney's lesions have only been performed on non-human animals and may not apply to humans. One unpublished study by Frank Sharp reportedly showed no damage by the NDMA antagonist, ketamine, a similar drug, far beyond recreational doses, but due to the study never having been published, its validity is highly controversial. Phencyclidine has also been shown to cause schizophrenia-like changes in N-acetylaspartate and N-acetylaspartylglutamate in the rat brain, which are detectable both in living rats and upon necropsy examination of brain tissue. It also induces symptoms in humans that mimic schizophrenia. 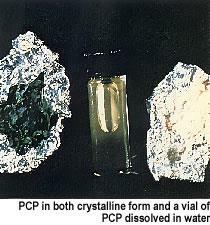 PCP was first synthesized in 1926, and was developed by Parke-Davis in Michigan under the tradename named Sernyl in the 1950s as an anesthetic but because of its long half-life and adverse side effects, such as hallucinations, mania, delirium, and disorientation, it was removed from the market in 1965 and limited to veterinary use. Illicit PCP seized by the DEA in several forms. PCP comes in both powder and liquid forms (PCP base is dissolved most often in ether), but typically it is sprayed onto leafy material such as cannabis, mint, oregano, tobacco, parsley, or ginger leaves, then smoked. PCP is a Schedule II substance in the United States and its ACSCN is 7471. Its manufacturing quota for 2014 was 19 grams. It is a Schedule I drug by the Controlled Drugs and Substances act in Canada, a List I drug of the Opium Law in the Netherlands, and a Class A substance in the United Kingdom. In its pure (free base) form, PCP is a yellow oil (usually dissolved in petroleum ether, diethyl ether, or tetrahydrofuran). Upon treatment with hydrogen chloride gas, or isopropyl alcohol saturated with hydrochloric acid, this oil precipitates into white-tan crystals or powder (PCP hydrochloride). In this, the salt form, PCP can be insufflated, depending upon the purity. However, most PCP on the illicit market often contains a number of contaminants as a result of makeshift manufacturing, causing the color to range from tan to brown, and the consistency to range from powder to a gummy mass. These contaminants can range from unreacted piperidine and other precursors, to carcinogens like benzene and cyanide-like compounds such as PCC (piperidinocyclohexyl carbonitrile). The term "embalming fluid" is often used to refer to the liquid PCP in which a cigarette is dipped, to be ingested through smoking, commonly known as "boat" or "water". The name most likely originated from the somatic "numbing" effect and feelings of dissociation induced by PCP, and has led to the widespread and mistaken belief that the liquid is made up of or contains real embalming fluid. Occasionally, however, some users and dealers could have, believing this myth, used real embalming fluid mixed with, or in place of, PCP. Smoking PCP is known as "getting wet", and a cigarette or joint which has been dipped in PCP may be referred to on the street as a "fry stick", "sherm" (shermingham), "D-Bone" "leak", "Dust", "amp", "lovely", "toe tag", "dipper", "T-Bone", "happy stick", "greeners",or "wet stick". Behavioral effects can vary by dosage. Low doses produce a numbness in the extremities and intoxication, characterized by staggering, unsteady gait, slurred speech, bloodshot eyes, and loss of balance. Moderate doses (5–10 mg intranasal, or 0.01–0.02 mg/kg intramuscular or intravenous) will produce analgesia and anesthesia. High doses may lead to convulsions. Users frequently do not know how much of the drug they are taking due to the tendency of the drug to be made illegally in uncontrolled conditions. Psychological effects include severe changes in body image, loss of ego boundaries, paranoia, and depersonalization. Hallucinations, euphoria, and suicidal impulses are also reported, as well as occasional aggressive behavior. :48–49 Like many other drugs, phencyclidine has been known to alter mood states in an unpredictable fashion, causing some individuals to become detached, and others to become animated. PCP may induce feelings of strength, power, and invulnerability as well as a numbing effect on the mind. Studies by the Drug Abuse Warning Network in the 1970s show that media reports of PCP-induced violence are greatly exaggerated and that incidents of violence are unusual and often limited to individuals with reputations for aggression regardless of drug use. :48 This said, there have been a few, very-televised events of PCP-intoxicated individuals acting in an unpredictable fashion, possibly driven by their delusions or hallucinations. One famous example is the case of Big Lurch, a former rapper with a history of violent crime, who was convicted of murdering and cannibalizing his roommate while under the influence of PCP. Other commonly cited types of incidents include inflicting property damage and self-mutilation of various types, such as pulling one's own teeth. :48 These effects were not noted in its medicinal use in the 1950s and 1960s, however, and reports of physical violence on phencyclidine have often been shown to be unfounded. Recreational doses of the drug also occasionally appear to induce a psychotic state that resembles a schizophrenic episode, sometimes lasting for months at a time. Users generally report feeling detached from reality. Management of phencyclidine intoxication mostly consists of supportive care – controlling breathing, circulation, and body temperature – and, in the early stages, treating psychiatric symptoms. Benzodiazepines, such as lorazepam, are the drugs of choice to control agitation and seizures (when present). 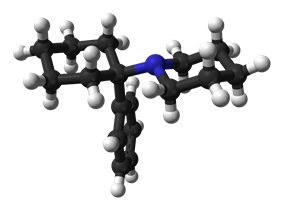 Typical antipsychotics such as phenothiazines and haloperidol have been used to control psychotic symptoms, but may produce many undesirable side effects – such as dystonia – and their use is therefore no longer preferred; phenothiazines are particularly risky, as they may lower the seizure threshold, worsen hyperthermia, and boost the anticholinergic effects of PCP. If an antipsychotic is given, intramuscular haloperidol has been recommended. ^ a b "NIDA InfoFacts: Hallucinogens – LSD, Peyote, Psilocybin, and PCP". DrugAbuse.gov. National Institute on Drug Abuse. Retrieved 2011-01-26. ^ Large, CH; Bison, S; Sartori, I.; Read, K. D.; Gozzi, A.; Quarta, D.; Antolini, M.; Hollands, E.; Gill, C. H.; Gunthorpe, M. J.; Idris, N.; Neill, J. C.; Alvaro, G. S. (2011). "The Efficacy of Sodium Channel Blockers to Prevent Phencyclidine-Induced Cognitive Dysfunction in the Rat: Potential for Novel Treatments for Schizophrenia". Journal of pharmacology and experimental therapeutics 338 (1): 100–113 =. ^ a b Seeman P, Guan HC, Hirbec H (August 2009). "Dopamine D2High receptors stimulated by phencyclidines, lysergic acid diethylamide, salvinorin A, and modafinil". Synapse 63 (8): 698–704. ^ Klockgether, Thomas; Turski, Lechoslaw, Schwarz, Michael, Sontag, Karl-Heinz, Lehmann, John (1 October 1988). "Paradoxical convulsant action of a novel non-competitiveN-methyl-d-aspartate (NMDA) antagonist, tiletamine". Brain Research 461 (2): 343–348. ^ Hirsch, JC; Crepel, F (1991). "Blockage of NMDA receptors unmasks a long-term depression in synaptic efficacy in rat profrontal neurons in vitro". Exp Brain Res 85 (3): 621–624. ^ Breier, AK; Malhotra, DA; Pinals, DA; Weisenfeld, NI; Pickar, D (1997). "Association of ketamine-induced psychosis with focal activation of the prefrontal cortex in healthy volunteers". Am J Psychiatry 154 (6): 805–811. ^ Suzuki, Y; Jodo, E; Takeuchi, S; Niwa, S; Kayama, Y (2002). "Acute administration of phencyclidine induces tonic activation of medial prefrontal cortex neurons in freely moving rats". Neuroscience 114 (3): 769–779. ^ Aguayo, LG; Warnick, JE; Maayani, S; Glick, SD; Weinstein, H; Albuquerque, EX (1982). "Site of action of phencyclidine. IV. Interaction of phencyclidine and its analogues on ionic channels of the electrically excitable membrane and nicotinic receptor: implications for behavioral effects". Molecular Pharmacology 21 (3): 637–647. ^ Zarantonello, P; Bettini, E; Paio, A; Simoncelli, C; Terreni, S; Cardullo, F (2011). "Novel Analogues of ketamine and phencyclidine as NMDA receptor antagonists". 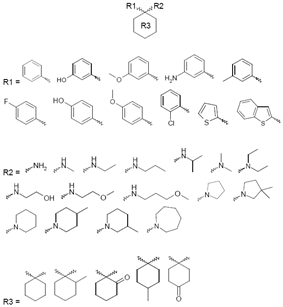 Bioorganic and medicinal chemistry letters 21 (7): 2059–2063. ^ Lin, H; Vicini, S; Hsu, FC; Doshi, S; Takano, H; Coulter, DA; Lynch, DR (2010). "Axonal α7 nicotinic ACh receptors modulate presynaptic NMDA receptor expression and structural plasticity of glutamatergic presynaptic boutons". Proc Natl Acad Sci USA 107 (38): 16661–16666. ^ Fisher, JL; Dani, JA (2000). "Nicotinic receptors on hippocampal cultures can increase synaptic glutamate currents while decreasing the NMDA-receptor component". Neuropharmacology 39 (13): 2756–69. ^ Prestori, F; Bonardi, C; Mapelli, L; Lombardo, P; Goselink, R; De Stefano, ME; Gandolfi, D; Mapelli, J; Bertrand, D; Schonewille, M; De Zeeuw, C; D'Angelo, E (2013). "Gating of long-term potentiation by nicotinic acetylcholine receptors at the cerebellum input stage". PLOS ONE 8 (5): e64828. ^ Seeman, P; Ko F and Tallerico, T (April 2005). "Dopamine receptor contribution to the action of PCP, LSD and ketamine psychotomimetics". Molecular Psychiatry 10 (9): 877–883. ^ Giannini AJ, Nageotte C, Loiselle RH, Malone DA, Price WA (1984). "Comparison of chlorpromazine, haloperidol and pimozide in the treatment of phencyclidine psychosis: DA-2 receptor specificity". Journal of Toxicology. Clinical Toxicology 22 (6): 573–579. ^ Castellani S, Giannini AJ, Adams PM (1982). "Effects of naloxone, metenkephalin, and morphine on phencyclidine-induced behavior in the rat". Psychopharmacology 78 (1): 76–80. ^ Itzhak, Y; Kalir, A; Weissman, BA; Cohen, S (1981). "New analgesic drugs derived from phencyclidine". Journal of Medical Chemistry 24 (5): 496–9. ^ Chaudieu, I; Vignon, J; Chicheportiche, M; Kamenka, JM; Trouiller, G; Chicheportiche, R (1989). "Role of the aromatic group in the inhibition of phencyclidine binding and dopamine uptake by PCP analogs". Pharmacology, Biochemistry, and Behavior 32 (3): 699–705. ^ Olney J, Labruyere J, Price M (1989). "Pathological changes induced in cerebrocortical neurons by phencyclidine and related drugs". Science 244 (4910): 1360–1362. ^ Hargreaves R, Hill R, Iversen L (1994). "Neuroprotective NMDA antagonists: the controversy over their potential for adverse effects on cortical neuronal morphology". Acta Neurochir Suppl (Wien) 60: 15–9. ^ Reynolds, Lindsay M.; Susan M. Cochran, Brian J. Morris, Judith A. Pratt and Gavin P. Reynolds (March 1, 2005). "Chronic phencyclidine administration induces schizophrenia-like changes in N-acetylaspartate and N-acetylaspartylglutamate in rat brain". Schizophrenia Research 73 (2–3): 147–152. ^ Murray JB (May 2002). "Phencyclidine (PCP): a dangerous drug, but useful in schizophrenia research". J Psychol 136 (3): 319–327. ^ Maisto, Stephen A.; Mark Galizio; Gerard Joseph Connors (2004). Drug Use and Abuse. Thompson Wadsworth. ^ a b c d e Inciardi, James A. (1992). The War on Drugs II. Mayfield Publishing Company. ^ Loviglio, Joann (July 27, 2001). "Kids Use Embalming Fluid as Drug". ^ Dowty, Douglass (August 3, 2009). "Illegal drug users dip into embalming fluid". ^ a b Diaz, Jaime. How Drugs Influence Behavior. Englewood Cliffs: Prentice Hall, 1996. ^ Chudler, Eric H. "Neuroscience for Kids – PCP". Neuroscience for Kids. Retrieved 2011-01-26. ^ Brecher, M; Wang BW; Wong H; Morgan JP (1988). "Phencyclidine and violence: clinical and legal issues". J Clin Psychopharmacology 8 (6): 397–401. ^ Wish, ED (1986). "PCP and crime: just another illicit drug?". NIDA Res Monogr. 64: 174–89. ^ Luisada PV. The phencyclidine psychosis: phenomenology and treatment. In Petersen Rc, Stillman RC (eds). Phencyclidine (PCP) abuse: an appraisal. National Institute on Drug Abuse: Rockville, Maryland, 1978. ^ Pender JW (1972). "Dissociative Anesthesia". Calif Med 117 (4): 46–47. ^ A James Giannini (1997). Drugs of Abuse (Second ed.). Los Angeles: Practice Management Information Corp. p. 126. ^ a b c d Helman RS, Habal R (October 6, 2008). "Phencyclidine Toxicity". Retrieved on November 3, 2008. ^ a b c d Olmedo R (2002). "Chapter 69: Phencyclidine and ketamine". In Goldfrank LR, Flomenbaum NE, Lewin NA, Howland MA, Hoffman RS, Nelson LS (eds.). Goldfrank's Toxicologic Emergencies. New York: Retrieved on November 3, 2008 through Google Book Search. ^ a b c Milhorn HT (April 1991). "Diagnosis and management of phencyclidine intoxication". ^ Giannini AJ. Price WA. (1985). "PCP: Management of acute intoxication". Medical Times 113 (9): 43–49. ^ Giannini AJ, Eighan MS, Loiselle RH, Giannini MC (April 1984). "Comparison of haloperidol and chlorpromazine in the treatment of phencyclidine psychosis". Journal of Clinical Pharmacology 24 (4): 202–204.